Burl's Country Smokehouse: Cinnamon Rolls As Big As Your Head. This is one in a series on historical restaurants in the state of Arkansas. 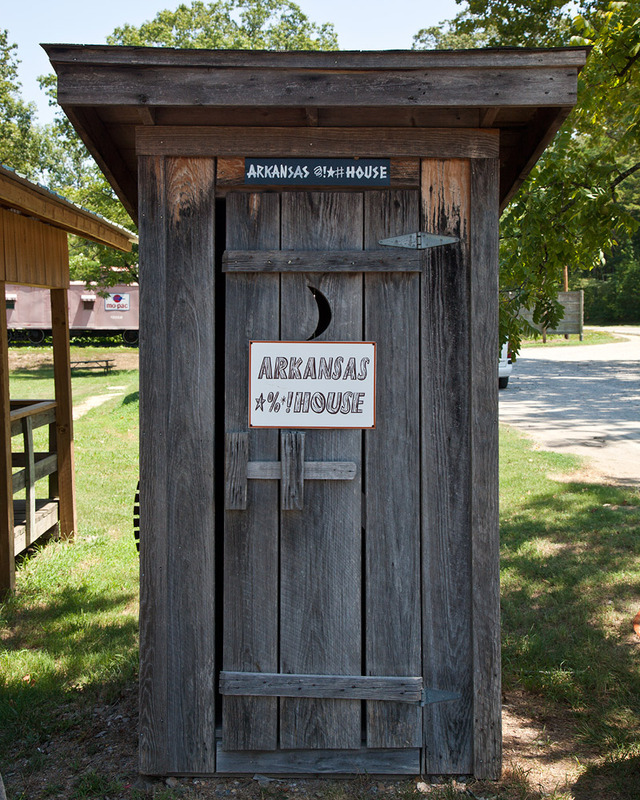 For a look at the Arkansas restaurant timeline, click here. Early Arkansas travelers knew a thing or two about "fast food." While drive-thru restaurants wouldn't appear in the state until the 1970s, the earliest travelers were usually prepared for a meal along their route. It would usually include shelf-stable items such as hard biscuits and jerky. Once the automobile became king and our highways saw pavement, long-distance travelers got used to having a stopping-in place. 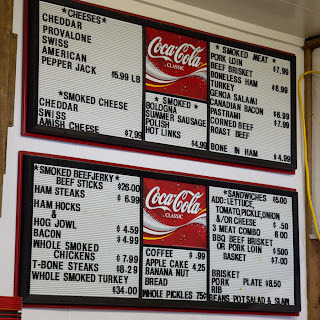 Almost every major highway traversing the state through the wilds and the forests had at least one smokehouse to stop at. 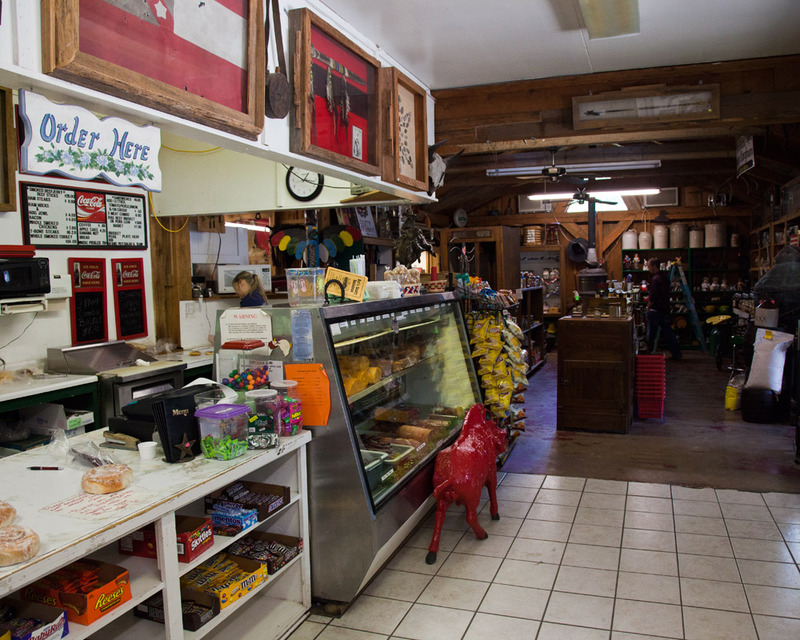 And at these you could always find some marvelous baked goods, made-to-order sandwiches and of course... jerky. 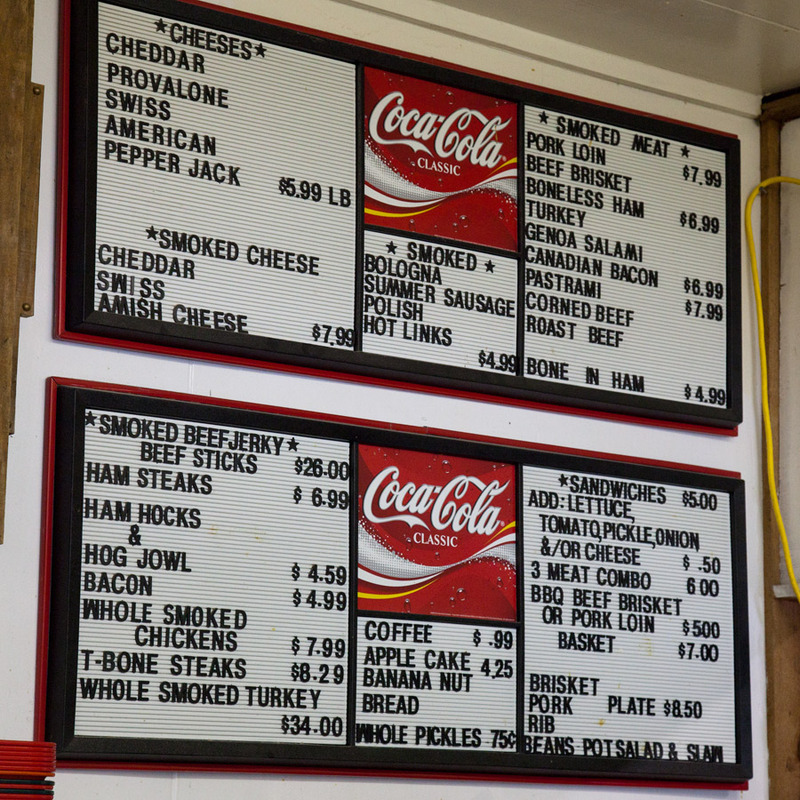 Burl's Country Smokehouse didn't start up til 1981, but it's still carrying on that roadside tradition. 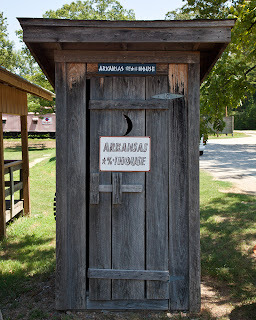 The complex on the north side of US 270 between Hot Springs and Mount Ida on the outskirts of Royal in the Ouachita National Forest is a strange collections of buildings that include old cabins, barn-like structures, an apparent depot, a "jail" and even an outhouse. Inside the main building, under wood-beamed rafters, there hangs the scent of smoke. The residue of more than 32 years worth of smoking fine meats has left an indelible mark here. Wander the store and see everything you might wish out of a country cupboard: Amish jellies, sundries, souvenirs and... jerky. That jerky I keep mentioning is different at Burl's than just about anywhere else. Unadulterated with a traditional marinade, the folks at Burl's instead let the smoke do the talking. Without that addition of pepper or spice before the smoking itself, the jerky retains a flavor of nothing but smoke and meat, much like you'd encounter at fireside all so many years ago.The sandwiches come piled high with your choice of meat -- pork loin, beef brisket, Genoa salami, turkey, Canadian bacon, pastrami, corned beef and roast beef. There are cheeses involved, and you would be well advised to choose one that has had its smoking treatment. The Swiss and the cheddar are both of impeccable quality. But Burl's big claim to fame might come in the cinnamon rolls offered at checkout. 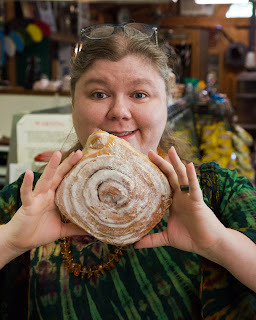 Wrapped tightly in plastic wrap, the rolls are compact spirals of pastry and sugar and spice in a package as big as your head -- or at least as big as mine, as you can see here. Burl's ignores the conventions of a traditional roadside attraction with seasonal hours -- instead, it's open throughout the year. Drop in on your way to dig crystals next time you're in the area. You'll find Burl's Country Smokehouse at 10176 Albert Pike (Highway 270) way out from Hot Springs. No website, but you can always call them at (501) 991-3875. Burl's is a must-stop anytime I'm in the area. The summer sausage is delicious. The cinnamon rolls are just as good as they are big. Yum! Now, I'm hungry for Burl's! I would like to purchase a picture you have forsale. Can you contact me? We've been stopping at Burl's since 2001. Every time we visit from Missouri, we put it and Albert Pike on our list of must stop. My kids grew up on those cinnamon rolls and jerky. I PAID for a pound of beef jerky, and have just over 1/2 pound. It ain't cheap. I went to get my first piece, and it is covered in mold less than 3 weeks later. I called and spoke to Burl. He said that I shouldn't have left it in the bag. I told him that nobody told me I had to store it any special way... it's beef jerky. He said "We don't have to tell you everything." He hung up on me twice. He doesn't care to reimburse me, nor to correct some really horrible food handling and customer service problems. I'm calling whatever health department (if any out there in the county) and calling 7 On Your Side, and whomever else will listen and help me. Burl called me back while typing this. He told me that he will "Do whatever I can to make you happy." I told him that I want my money back. He said "I'm not giving you your money back." Now it was my turn to hang up. Save your life... do NOT eat there. I have pictures of the moldy food. If anybody wants them, please PM me or look at my Facebook page. I PAID for a pound of beef jerkey, and have just over 1/2 pound. It ain't cheap. I went to get my first piece, and it is covered in mold less than 3 weeks later. I called and spoke to Burl. He said that I shouldn't have left it in the bag. I told him that nobody told me I had to store it any special way... it's beef jerky. He said "We don't have to tell you everything." He hung up on me twice. He doesn't care to reimburse me, nor to correct some really horrible food handling and customer service problems. I'm calling whatever health department (if any out there in the county) and calling 7 On Your Side, and whomever else will listen and help me. seen no hand washing no gloves, using one slicer for bread, meat, and cheese this is cross contamination, how long since health department been there, I don't need food poisoning. We have eaten there countless times over the last 18years and have never been served anything bad nor have We ever had anything but excellent customer service. Minute Man: Smoke on the Burger. Leo's Greek Castle: Classic in Hillcrest.